Father William Lockhart was a close friend and disciple of the great Anglican Divine, John Henry Newman. When he left Newman’s community at Littlemore in 1843, Newman was extremely pained. The event occasioned his famous sermon on The Parting of Friends. Within a couple of months Lockhart was received into the Catholic Church and soon afterwards entered the novitiate of the Institute of Charity (Rosminians). Newman himself and the rest of his Littlemore companions were received into the Catholic Church two years later. Lockhart became the founder and first parish priest (1874-1892) of St Etheldreda’s, having previously been the first parish priest of Our Lady and St Joseph’s, Kingsland, London, which he served for almost twenty years. For an excellent account of Lockhart’s life and significance, see Nicholas Schofield, William Lockhart, First Fruits of the Oxford Movement (Leominster, Gracewing, 2011). The text of Newman’s sermon, ‘The Parting of Friends’, can be downloaded here as a Word document. For Lockhart’s appreciation of Newman, read Cardinal Newman: A Retrospect of Fifty Years by one of his oldest living disciples (pages 1-18). And to Rosmini too, we parishioners of St Etheldreda’s owe a special debt. For Rosmini was not just a milestone in that strange providential journey that brought Lockhart from Oxford and Littlemore, via Ratcliffe College and Kingsland to London EC1. Rosmini was also the main inspiration, under God, of Lockhart’s entire life as a Catholic. 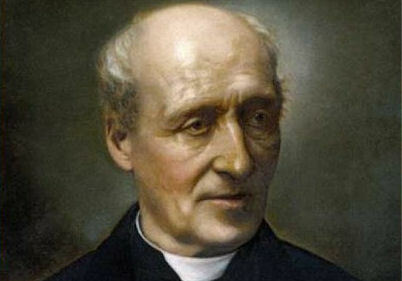 As Lockhart himself put it: ‘Newman had impressed me more perhaps than any but one other man, the master of thought under whom I passed when I left Newman – Antonio Rosmini, the founder of the Order to which I have the honour to belong.’ It was Rosmini who had sent the singularly gifted Luigi Gentili and other missionaries to England to hasten the ‘Second Spring’ of English Catholicism; it was as a Rosminian that Lockhart became the founder of our parish; and it was to the person of Rosmini, to his mission, and writings, that Father Lockhart devoted the rest of his life.